18:00h In the Palau del Rei Moro, SECOND HAND MARKET OF CHILDREN'S CLOTHING, where you can exchange, buy or sell everything you need for the small party. 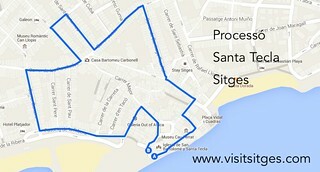 Participating Sitgetan entities: Agrupació de Balls Populars de Sitges, Ateneu Popular, Colla Jove de Castells de Sitges, SACA (Sitgetana de Cultura i Animació), Casino Prado Suburense and Societat Recreativa El Retiro. 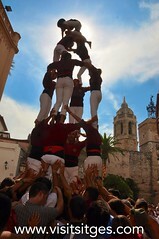 Event organized by les Barraques and with the assistence of Comissió de Festa Major. 01:15h. Festa Sonora at the Barraques area, with Dj Tillo ( Orishas, Skratch, Comando ), La Palmera Torta Selectors (Dj L & Dierkamps) , C-Nin & Carlos López). 20:00h. In la Sitgetana Craftbeer (c/Sant Bartomeu, 10), Opening of the Exhibition of the contest "V Concurso de Instagram de Fiesta Mayor". During the event, prizes will be awarded to the top three. 21:00h, in the Hort de Can Falç, NIT DE LES PUBILLES I ELS HEREUS 2017 Lunch-Ball with the proclamation of the "Pubilla" (Queen) and Hereu (king) of Sitges 2017. 11:00h, Location: Hort de Can Falç, KIDS PARTY. 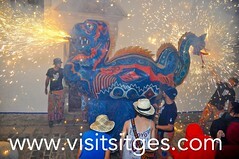 Entertainment by Sitges puppet company LA TIJA and musical band Eufagis. Children and relatives are invited. 18:00h, Location: Espai Cultural Pere Stämfli, Opening of the photo exhibition of "XVIII Concurs de Fotografia de Festa Major" (photo contest of Festa Major) and corresponding AWARDS. This exhibition will remain open until 1st October. 20:00h, TIMBALADA. (Drummer's parade) The drummers of "colles de foc" (drummers of the groups Aliga, Drac and demonds of Festa Major) will do the following route: Plaça del Pou Vedre, Parellades, Cap de la Vila, Major, Plaça de l’Ajuntament. 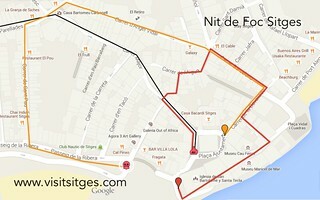 20:30h, From the location of El Baluard, starting of "LA NIT DE FOC" (Night of Fire) through the streets of the old town. 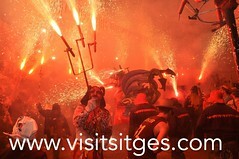 With the participation of the demond's groups: Front Diabòlic de La Garriga, Ball d’Enveja de Vilanova i la Geltrú, Guspires de Sants, Ball de Diables Vila-seca, Bretolàs de Sant Andreu, Espetegafoc, the 3 demond groups of Sitges and Àliga de Sitges. 23:00h, To follow, in the same place, final party with the CONCERT of Ojo de Buen Cubero, Miquel del Roig and Dalton Bang. 10:00h. Concentration of "GEGANTS I CABEÇUTS infantils" (paper maché giants and "big-heads" made by children) . Location: Plaça Ajuntament. 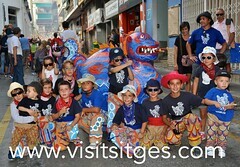 Performance of "BALL DE DIABLES INFANTIL" (satiric verses performed by children) by the groups: de Colla de l'Agrupació de Balls Populars de Sitges, Colla Vella and Colla Jove. 19:00h, Location: Patio of the Centro Cultural Miramar, Conference «I tú, els vols portar? » (And you, do you want to take them?) moderated by Alba Gràcia Pañella. 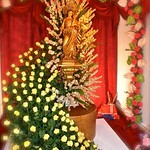 20:00h, Departing from the Parish Church of Sant Bartomeu and Santa Tecla: Reverend Josep Pausas, the Municipal Commission of the Festa Major, and the Agrupació Musical Suburband will parade the icon of Santa Tecla to the home of "pendonista" Mrs. Immaculada Almiñana i Malivern, on Calle Jesús, 20. 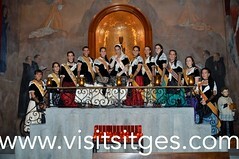 10:00h-14:00h and 17:00h-21:00h, EXHIBITION OF THE IMAGE OF SANTA TECLA. Location: street Jesús, 20. 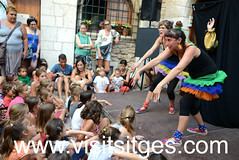 17:00h Location: Palau del Rei Moro, FIESTA INFANTIL, (children's festival) with workshops and recital of a tale. Chocolate for all children. 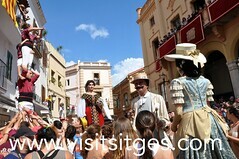 To follow, VESTIM ELS GEGANTS MOROS (Let us dress "Gegants Moros") a chidren's event in front of the Palau del Rei Moro. 10:00h. 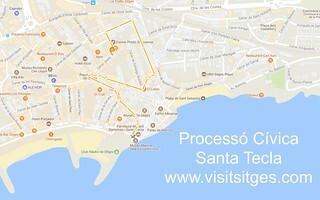 and till the start of the Civic Procession, EXHIBITION OF THE IMAGE OF SANTA TECLA. Location: street Jesús, 20. 19:00h, From street Jesús, 20, the Pendonista's home, Mrs. Immaculada Almiñana i Malivern, accompanied by the "Cordonistes" , departure of the PROCESIÓN CÍVICA. 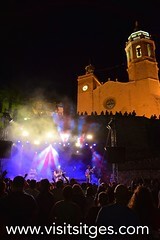 Popular dances, traditional musiciens and la Asociación Musical Suburband del Retiro and the authorities , will take Santa Tecla to the Parish Church. Route Matinal Gran 7:00h. (big "matinal"): Fonollar, Baluard Vidal i Quadras, Port de n'Alegre, Rafael Llopart, Sant Damià, Sant Sebastià, Jesús, Sant Bartomeu, Sant Gaudenci, Sant Josep, Bonaire, Passeig de la Ribera (mar) hasta la Fragata. Route Matinal Petita 7:30h (small m"matinal): desde Plaça Ajuntament, d'En Bosch, Davallada, Barcelona, Àngel Vidal, Cap de la Vila, Parellades, Sant Pere, Passeig de la Ribera (montaña), hasta la Fragata. 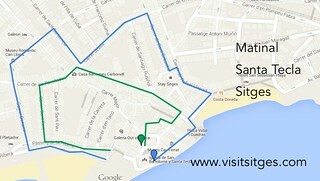 Starting at the Baluard, the "cercavila" (circuit around town with the authorities, the Saint and the folkloric dances and musicians) ends with the Saint being returned to the parish church. As is custom, the shrine will be preceded by the traditional dances, the grallers, and the Agrupació Musical Suburband de El Retiro. 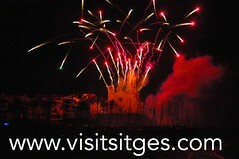 Last dance of the "Bèsties de foc" and "Gegants"
18:00h. Location La Fragata, XXIXè CONCURS NACIONAL DE COLLES SARDANISTES TROFEU VILA DE SITGES: Spectacle sardanista (sardanes dancing), competition with the participation of the best groups of the present time in the modalities of alevín, infantil and juvenil, who will fight to achieve the classification for the championship of Catalonia. 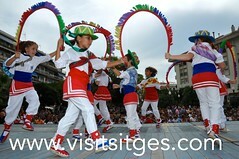 Large groups will dance to the VILA DE SITGES Trophy. It will musically enliven the Sardana's competition, the excellent Cobla Maricel. 18:00, Location: Parroquia de Sant Bartomeu y Santa Tecla, ORGAN CONCERT of Santa Tecla by Maurizio Salerno (Milán). Entry: voluntary contribution. 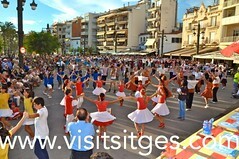 19:00h, BAILE PARA LA GENTE MAYOR (Dance for the elderly) Location: Hort de Can Falç, with the group El Duet.